Canadian astronaut Chris Hadfield stops in Calgary while on tour with a new talk commemorating the 50th anniversary of the Apollo moon landing. Hadfield is a decorated NASA astronaut who became a household name after the video of his rendition of David Bowie's "Space Oddity" went viral. He'll be discussing the past and future of space exploration. After two years of sold-out shows in Edmonton, Crescendo comes to the Jack Singer Concert Hall for a collaboration with the Calgary Philharmonic Orchestra. Crescendo is a classic rock concert fundraiser to raise money for the Alberta Children's Hospital Foundation's “Build Them Up” campaign in support of the new Centre for Child and Adolescent Mental Health being built in Calgary. Come sing along, rock out and support the wellbeing of young people in our province. 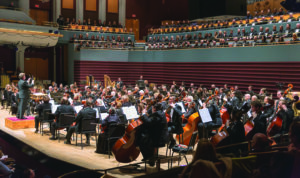 The winners of Calgary Civic Symphony and the Rotary Calgary's Concerto Competition will perform works by the masters at this celebration of their success. The anchors of the program are Wagner's "Die Meistersinger Overture" and Borodin's "Polovetsian Dances," plus concertos by the winners: Typhen Chan (violin), Joan Herget (cello), Sua Kwoun (cello) and Jessica Yuma (piano). Get some insight on what makes these winners so special by arriving early for the pre-concert chat at 1:45 p.m.